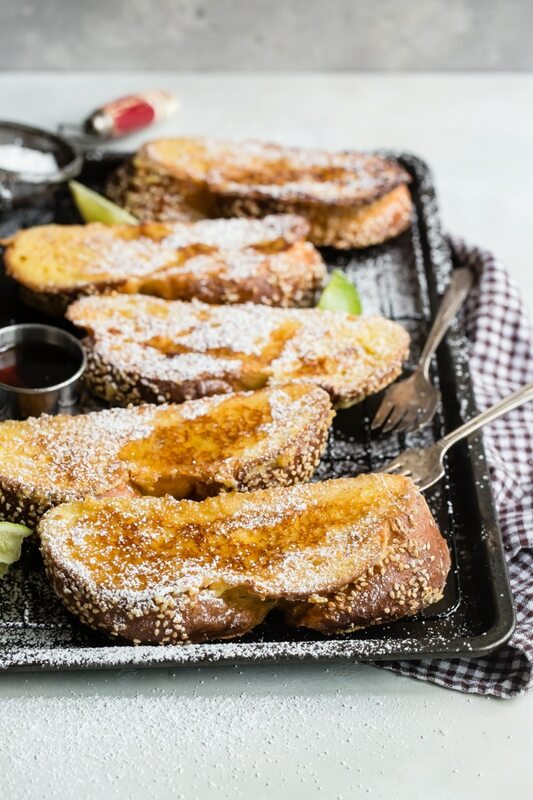 Just when you thought French toast couldn’t get any better, here it is: Challah French Toast makes one of the most indulgent and delicious breakfasts ever. Serve these crispy-on-the-outside, custard-on-the-inside slices with your favorite fresh fruit and lots of warm syrup. 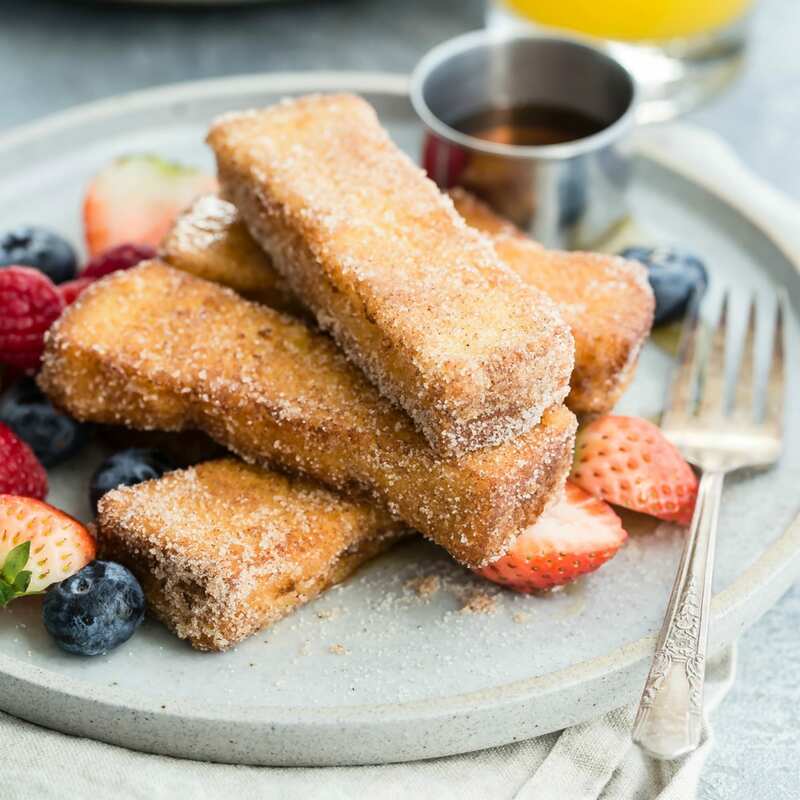 I’ve already shared one of my favorite childhood breakfast recipes for French Toast Sticks— smuggled out of the Magic Kingdom. However, this is my favorite gourmet French Toast recipe. 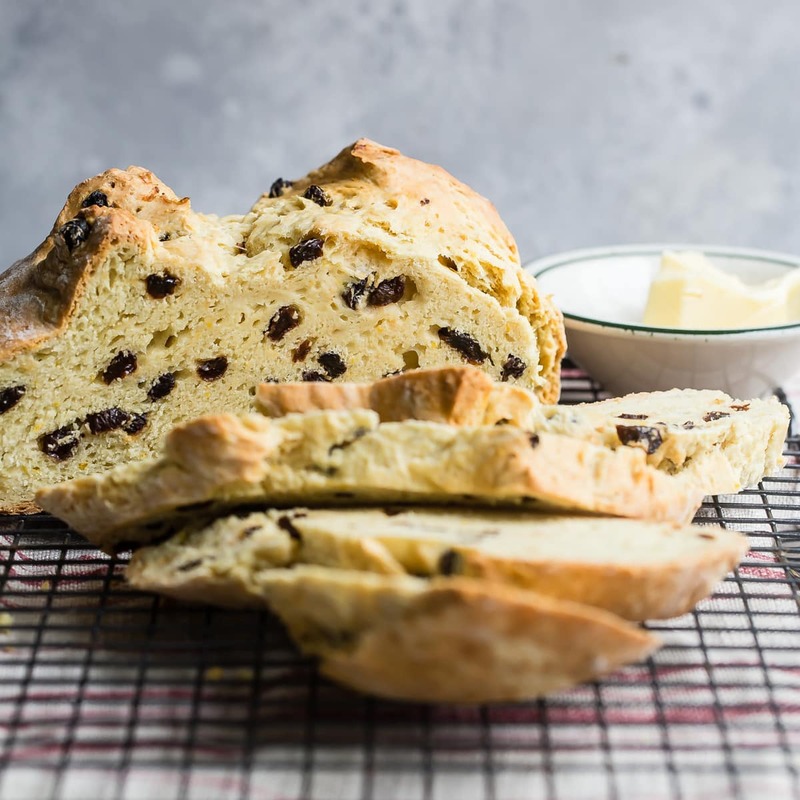 It’s loaded up with cinnamon and nutmeg, given a generous dusting of powdered sugar, and served with tangy lime wedges for a totally different but completely outstanding flavor. In my humble opinion, it may be better than the challah French toast Ina makes. If bread could be compared to a cloud, Challah bread is nothing short of the majestic cumulus. It’s soft, fluffy, and tastes like a dream, even though the dough is enriched with butter and eggs. 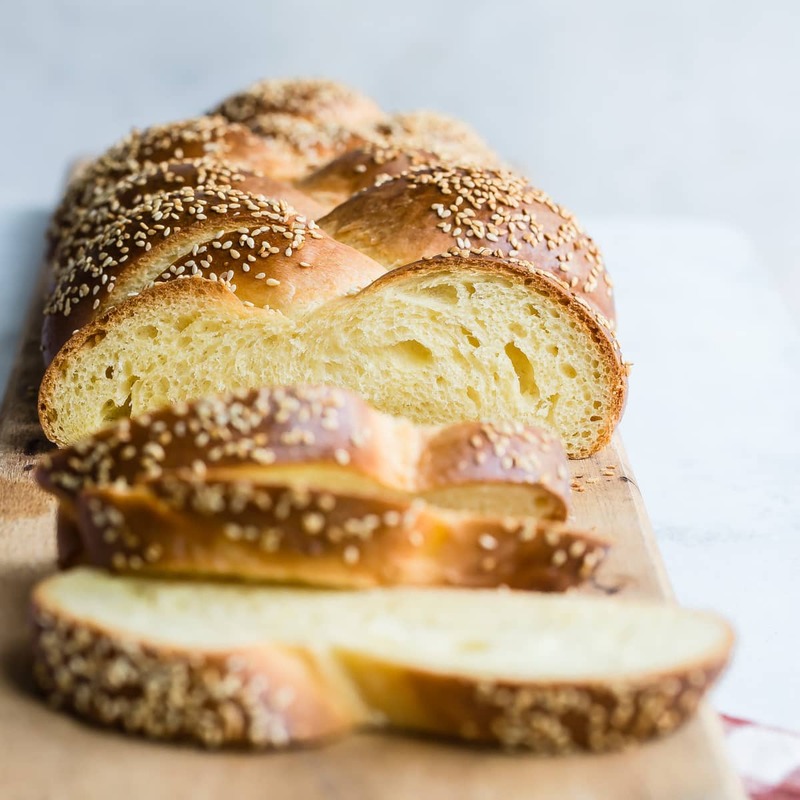 Making homemade Challah bread is truly an art form, so if you’re willing to dip your toe into the world of bread making, this recipe for homemade Challah Bread is a wonderful place to start. Otherwise, if you have a good source for Challah—a Jewish bakery or well-stocked deli—you may already know how magical this kind of bread is. But really, any eggy bread or brioche will do for this recipe, if you have it. 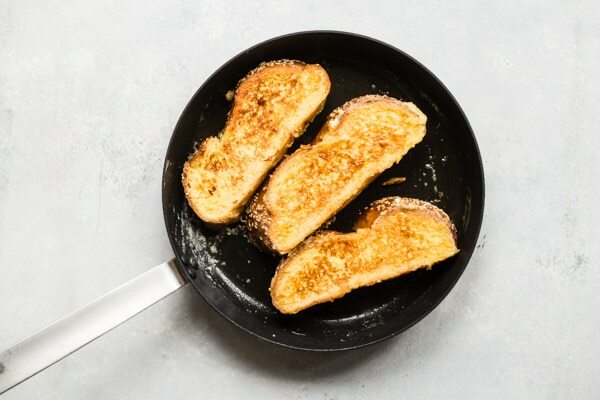 Once you taste how good the French toast is, you’ll never go back to plain old white bread again. Making Challah French Toast for a sleepover surprise? Click and slide the number next to “servings” on the recipe card below to adjust the ingredients to match how many you’re feeding—the recipe does the math for you, it’s that easy. 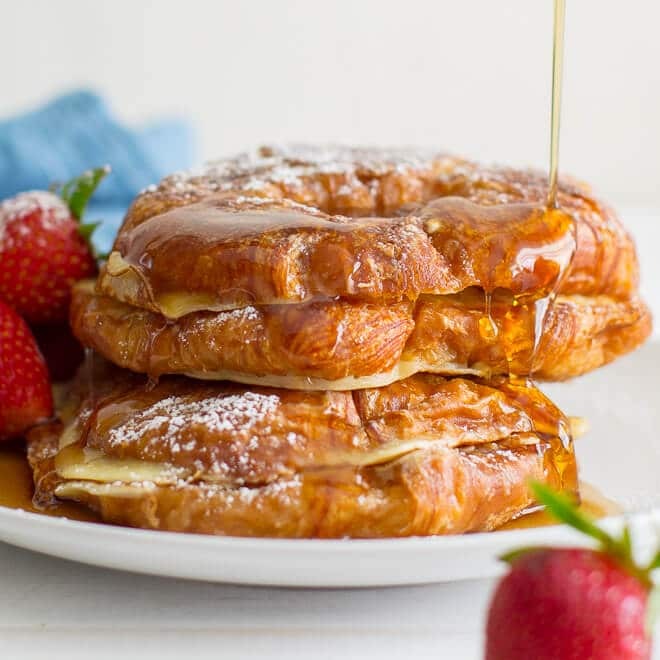 How do you make fluffy French Toast? First, slice the bread on the thicker side—3/4” to 1” thick. Challah already has big “fluff” factor because of the egg yolks. Can you make Challah French Toast with fresh bread? 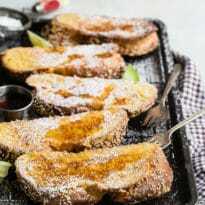 Ideally, stale bread works best for This Challah French Toast recipe, since the bread should dry out a little in order to soak up every last drop of the egg custard. But if you simply must make French Toast NOW, here’s what you can do. Just slice up the bread and spread out the slices on a sheet pan. Bake in a very low oven (200-225 degrees) until the bread becomes somewhat dry but not toasted. Now you’re ready to rock n’ roll! Can you make French Toast without milk? Absolutely you can! 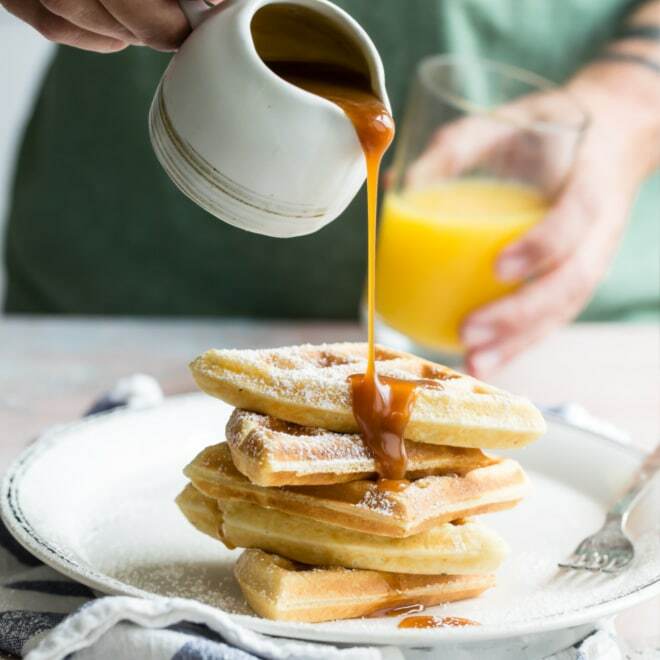 Substitute out coconut milk or any nut milk in place of the half and half, then cook the French toast in oil, rather than butter. Eggy bread, pain perdu, lost bread, torriga, ameritte, egg fried bread, even “Nun’s toast”, aka what we now call French toast. It has been made by hungry people ever since there was bread. No matter what name you prefer, it’s an ingenious recipe. A good way to use up day old or stale bread and feed hungry bellies at the same time, especially when fresh bread was made every single day. 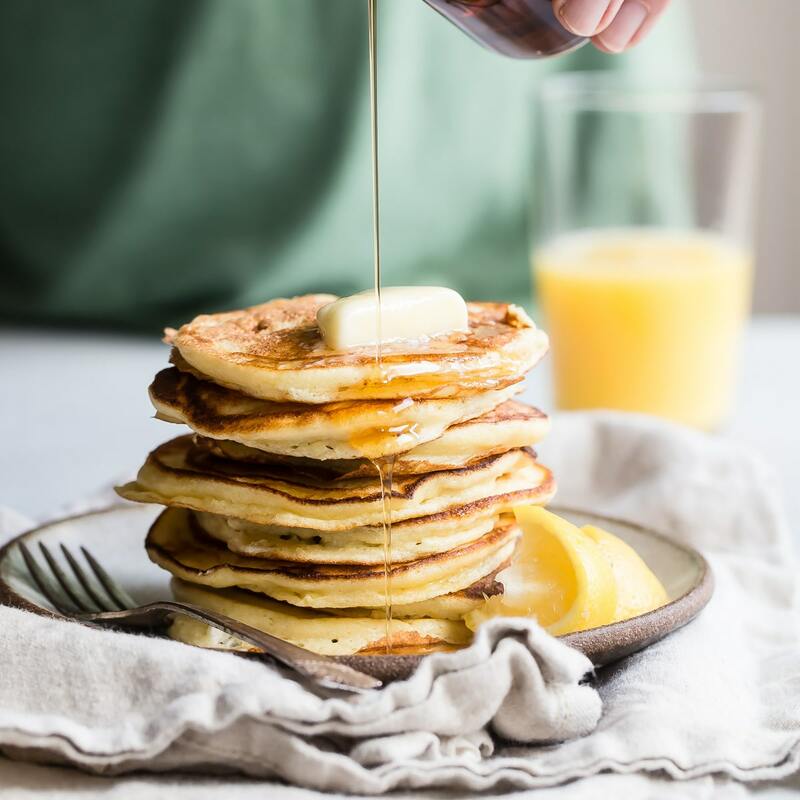 Today, we know it as a rather sweet breakfast dish made of custard soaked bread fried up until crispy in the pan. How do you make overnight Challah French toast? You can make casserole style Challah French toast in a shallow baking dish, allowing the bread to soak overnight in the custard. 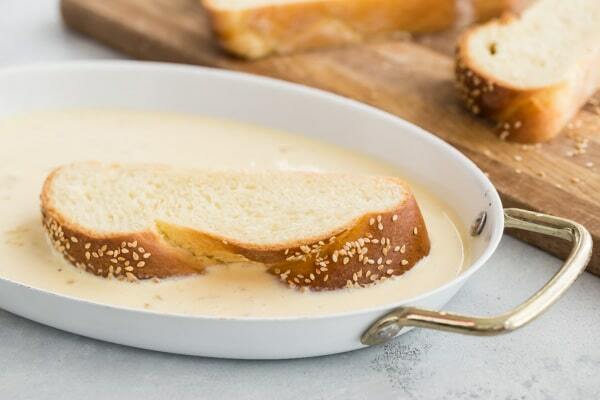 Arrange the challah in the oven-proof dish, then pour the custard over the bread. In the morning, all you have to is pop it in the oven. Bake at 350 degrees for about 35 minutes. You’re going to love how easy this is. First, make the custard: whisk together the eggs, cream, nutmeg, vanilla, and cinnamon in a shallow dish. Then preheat a skillet, or use an electric skillet set to 350 degrees. Melt the butter in the skillet until foaming. Dredge the slices of bread in the custard, a few at a time, and place in the hot butter. Cook until the edges of the bread are golden brown; this should take about 1 to 2 minutes. Gently flip over the bread and cook another 1 or 2 minutes. Keep finished slices of Challah French Toast on a sheet tray, in a warm oven (at about 200 degrees) so everyone can eat at once! 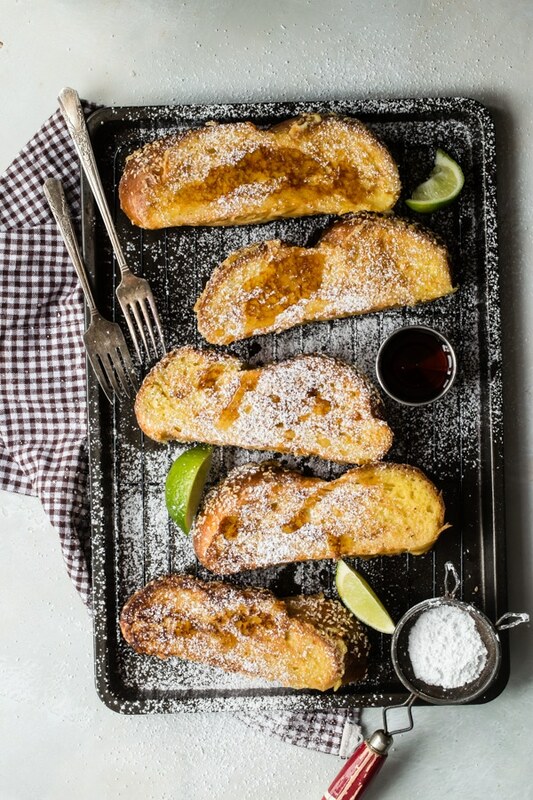 To serve, pile on the powdered sugar and serve with some juicy lime wedges. Just wait until you try it! Preheat oven to 200 degrees. Set a metal rack on a rimmed baking sheet. Slice Challah bread into 3/4-inch slices (about 12 slices). In a shallow dish or pie plate, whisk together eggs, half and half, sugar, vanilla, cinnamon, and nutmeg. In a large skillet over medium-high heat, melt 1 tablespoon butter until foaming, swirling to coat pan. Working with 3 to 4 slices of bread at a time, dredge in egg mixture. Carefully tap against the side of the dish to remove excess, and set in pan. Cook until edges are set and the first side is golden brown, about 1 to 2 minutes. Using a thin, wide spatula, flip each piece and continue to cook until the second side is golden brown, 1 to 2 minutes longer. Transfer to oven to keep warm and repeat with remaining bread slices and batter (add more butter to the pan between batches). Dust generously with powdered sugar. Serve with butter and lime wedges. An electric griddle set at 350 degrees can be used in place of a skillet.